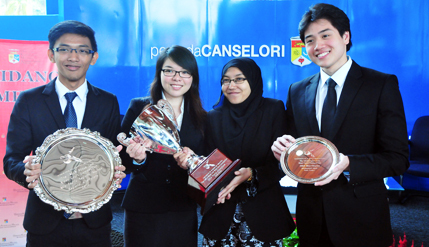 BANGI, 26 Jun 2014 – A debating team from The National University of Malaysia (UKM) has won the International Air and Space Law Academy moot court competition held inCerlce National de Armees in St Augustin Paris recently. A member of the four-man team, Alex Choo Wen Chun was judged the best mooter in the championship. The other members of the team are Aisha Nazura Rosli, Zaky Abdul Shukor and Lilian Lee, all from the Faculty of Law. Vice Chancellor Prof Datuk Dr Noor Azlan Ghazali congratulated the team for their achievement saying that studying at UKM which upholds the use of Bahasa Malaysia at university level is not a hindrance to be good in English. It had not stopped the team from becoming champions in a competition based on oratory skills in English. Prof Noor Azlan said UKM’s Law Faculty has also been identified as being the best law faculty in the country. The team had earlier won the national competition for selection to the regional level where they were judged the best enabling them to represent Asia at the international level in Paris. The team said they never expected to get that far but their hard work staying on in the university even during semester holidays and making preparations until past midnight had paid dividends showing the world that UKM students can be the best.